Roland Sands has a way of designing really stylish, casual-inspired motorcycle gear. The Riot Jacket has a different design and a lighter feel, compared to the Maven. 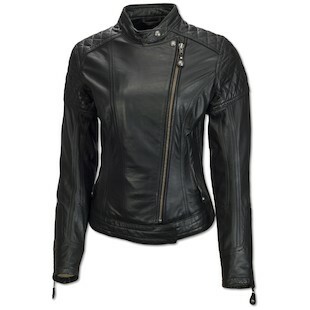 Although the Maven is also a really cool jacket, the Riot is a lighter, softer version with an updated look. I have a Maven and it just feels heavy overall, not as comfortable as the Riot. I feel like they borrowed the design of the men’s Clash and turned it into a softer, more relaxed version for women. Good idea, because I absolutely love it. I’m also a huge fan of the asymmetric zipper down the front, which gives it that retro look. I would say that if you need more room in the bust, order one size up. Keep in mind that the sleeves run a bit long, so if you need a shorter sleeve, the Riot may not work well for you. I normally wear size small in most women’s gear, but the Riot in a size up was perfect. Not too tight, not too loose. Guys, take note. I think the Riot is going to climb to the top of every woman’s birthday, anniversary, and holiday lists this year.